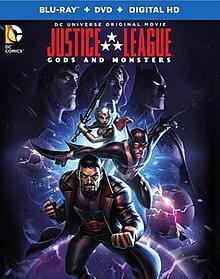 Justice League: Gods and Monsters is a 2015 direct-to-video animated superhero film featuring an alternate universe version of the DC Comics superhero team the Justice League and is part of the DC Universe Animated Original Movies. It was released as a digital download on July 21, 2015, and released on DVD and Blu-ray on July 28, 2015. In an alternate universe, the Justice League—Batman (Dr. Kirk Langstrom), Wonder Woman (Bekka), and Superman (Hernan Guerra, son of General Zod)— is a brutal force that maintains order on Earth. The lack of accountability for the League is challenged following the suspicious deaths of three scientists: Victor Fries; Ray Palmer; and Silas Stone, along with his young son Victor Stone. When suspicion falls on the Justice League, President Amanda Waller asks that they cooperate with the government's investigation. Wonder Woman speaks to Steve Trevor to learn what the government knows while Superman invites Lois Lane to the Tower of the Justice, where he tells her of his goals to help humanity, and reveals how little he knows about Krypton or his heritage. Batman discovers an email sent to Silas Stone and a number of scientists, including Dr. Will Magnus, Kirk's best friend who helped with his transformation. He asks Magnus, and his wife Tina, about "Project Fair Play", which involved all the scientists under Lex Luthor's employ, but Magnus reveals nothing. The League locates the remaining scientists (consisting of John Henry Irons, T.O. Morrow, Michael Holt, Pat Dugan, Emil Hamilton, Karen Beecher, Thaddeus Sivana, Kimiyo Hoshi, and Stephen Shin) who are meeting at a house. Just then, the remaining scientists are attacked by three robotic assassins who travel via Boom tube. Despite their efforts, the assassins leave Magnus as the sole survivor of the attack. The League takes Magnus to the Tower to recover, while Superman flies to Lex Luthor's satellite orbiting the moon. Luthor reveals Project Fair Play is a weapons program to destroy the League if necessary. He also reveals he has the true information about Krypton, including Zod. As Superman leaves, a robotic assassin booms in and destroys the satellite, seemingly killing Luthor. Steve Trevor shows satellite footage of the explosion and Superman's presence to Waller, and she retaliates with Project Fair Play, which consists of troops and vehicles armed with energy weapons powered by red solar radiation like Krypton's sun. Superman and Wonder Woman face the army while Batman stays inside the Tower, where he activates the forcefield, thinking Magnus can clear the League. Tina, last seen killed by the robotic assassins, suddenly appears and subdues Batman before shape-shifting into a liquid metal robot and revives Magnus with an organic nanite serum similar to Batman's, which physically enhances him and gives him regenerative healing powers. Magnus reveals he orchestrated the framing of the League, with his robotic assassins actually being the Metal Men armed with 'Boom Tube' technology and red sun energy. Magnus tells Batman he intends to detonate a Nanite Bomb, with microscopic Boom Tubes teleporting nanites into every person on the planet, to forcefully link humanity together into a hive mind. He confesses he killed the real Tina in a fit of rage and replaced her with a robotic duplicate named Platinum, capable of mimicking human flesh, and joined Fair Play, intending to use its resources to fund his secret Nanite Bomb project. As Magnus prepares his weapon, Luthor, who escaped the explosion, teleports into the middle of the battle outside and tells everyone he has discovered Magnus' plan. Batman frees himself and seizes the opportunity to drop the forcefield. With Batman fighting Magnus, Wonder Woman faces Platinum, and Superman takes on the Metal Men, who quickly merge into a single, more powerful entity. Wonder Woman uses her sword's boom tube to send Platinum to the sun, while Superman destroys the Mother Boxes inside the Metal Men to keep them from 'Booming' before taking them underground and melting them inside molten rock. The League destroys the bomb (at the cost of Superman's Kryptonian escape craft) and, after being defeated by Batman, a remorseful Magnus commits suicide by disintegrating himself with nanites. A week later, the Justice League has been cleared of all wrongdoing, and the world, along with Lois Lane, views them differently. Bekka decides to leave the Justice League to face her past along with Lex Luthor, who wants to explore other universes after growing bored with this one. Before leaving, Lex Luthor gives Superman all the data on Krypton and tells him to be a "real hero". The film ends with Superman and Batman deciding to use the data to help humanity. Batman is Dr. Kirk Langstrom, a scientist who, after graduating college, has inadvertently transformed himself into superhuman pseudo-vampire in an attempt to cure his cancer with a nanite-infused serum, feeding on criminals to satisfy his hunger after it begins to eat away at his humanity. Wonder Woman is Bekka, a New God and the widow of Darkseid's son Orion, who fled Apokolips for Earth using a mother box-sword after the New God Highfather ruthlessly killed her husband as part of the massacre of the Apokolips royal family. Superman is Hernan Guerra, the genetically-engineered son of General Zod and Lara, who was rocketed to Earth as a child from the doomed planet Krypton following Jor-El's waylaying by Zod. Upon his arrival on Earth, Hernan is raised by a family of undocumented Mexican farmers. Having gone through the troubles that illegal immigrants face in the United States, he has become short-tempered and withdrawn from humanity with a deep contempt and resentment for authority. The list of scientists involved in Project Fair Play includes: John Henry Irons, T. O. Morrow, Michael Holt, Victor Fries, Pat Dugan, Emil Hamilton, Karen Beecher, Ray Palmer, Silas Stone, Dr. Thaddeus Sivana, Kimiyo Hoshi, Stephen Shin, and William Magnus. In the weeks before the debut of the film, a three-part series, Justice League: Gods and Monsters Chronicles, which focused on the characters and the universe of the film, was released online by Machinima on June 8, 2015. The series is the first collaboration between Warner Bros. and Machinima, following the former's investment of $18 million in Machinima in March 2014. The series is also the first production of Blue Ribbon Content, a digital content production unit of Warner Bros. formed in 2014 and led by president of Warner Bros. Animation Sam Register. The first season consisted of three episodes concluding on June 12, 2015. A second season of the series was planned to be released in 2016 and would have feature ten episodes. However as of September 30, 2016, it has been shelved. A series of one-shot comics written by J. M. DeMatteis and Bruce Timm was released and focused on each hero's origin story. Additionally, a three-issue prequel comic book series written by DeMatteis and Timm was also released. The film received mostly positive reviews from critics. Kofi Outlaw from Screenrant.com gave the film 5 out of 5 stars, praising Timm's and Burnett's writing, the new versions of the DC Trinity, the fight scenes and characters and calling it "a must-see for any DC fan". Joshua Yehl of IGN gave the film an 8.9/10 praising the excellent concept, Wonder Woman's origin story, the voice acting and the use of violence. It earned $2,770,898 from domestic home video sales. ^ a b Graser, Marc (September 17, 2014). "Machinima Lands Exclusive Animated 'Justice League' Series". Variety. Retrieved 2015-04-24. ^ "Forget everything you thought you knew about the @DCComics universe with Justice League: #GodsandMonsters, debuting June 8th". Twitter. Machinima. Retrieved June 2, 2015. ^ Spangler, Todd (October 21, 2014). "Warner Bros. Unveils Digital Short-Form Studio: Blue Ribbon Content". Variety. Retrieved 2015-04-24. ^ Means-Shannon, Hannah (May 4, 2015). "Justice League: Gods And Monsters Chronicles Season 2 Announced By Machinima, WB, And DC Comics (UPDATE)". Bleeding Cool. Retrieved 2015-05-06. ^ "[News]Justice League: Gods and Monsters Chronicles season 2 has been 'shelved'". Reddit. July 17, 2016. Retrieved 2016-11-12. ^ Beedle, Tim (April 16, 2015). "Exclusive: First Look at the Justice League: Gods and Monsters Comic". DC Comics. Retrieved 2015-05-06. ^ "Justice League: Gods and Monsters – Batman #1". DC Comics. Retrieved 2015-07-24. ^ "Justice League: Gods and Monsters – Superman #1". DC Comics. Retrieved 2015-07-24. ^ "Justice League: Gods and Monsters – Wonder Woman #1". DC Comics. Retrieved 2015-07-24. ^ "Justice League: Gods and Monsters #1". DC Comics. Retrieved 2015-07-24. ^ "Justice League: Gods and Monsters #2". DC Comics. Retrieved 2015-07-24. ^ "Justice League: Gods and Monsters #3". DC Comics. Retrieved 2015-07-24. ^ "'Justice League: Gods And Monsters' Review". screenrant.com. Retrieved 2015-07-24. ^ "JUSTICE LEAGUE: GODS AND MONSTERS REVIEW". IGN. Retrieved 2015-07-24. ^ "Justice League: Gods and Monsters". The Numbers listing. Retrieved 28 January 2019. This page was last edited on 1 April 2019, at 12:26 (UTC).